So you’d think a “building” instalment that involves finishing a single kit part wouldn’t be a problem. But you’d be wrong. 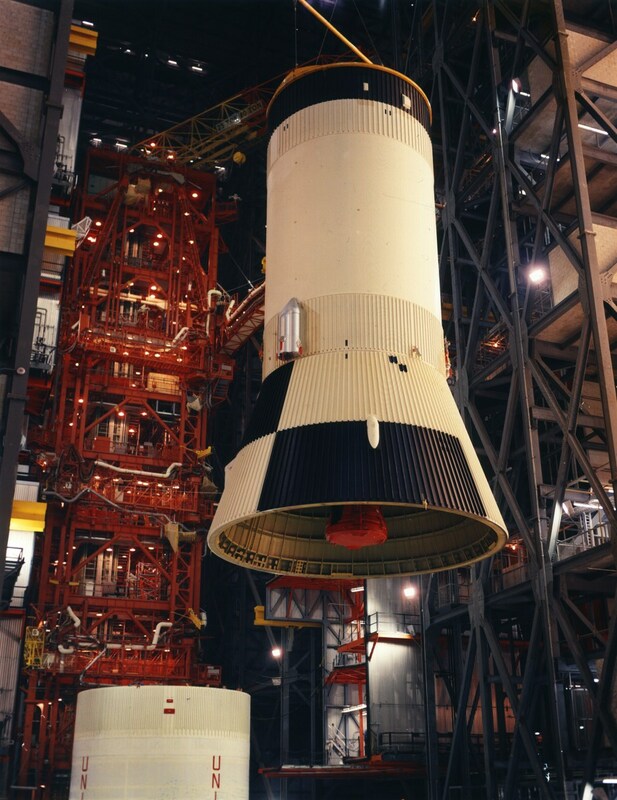 The S-IVB Aft Interstage strikes fear into the heart of anyone who has ever painted a Saturn V model kit, because it involves painting horizontal black/white separations around the curve of a ribbed cone. The potential for paint masking to go horribly wrong is high. There are other, Revell-specific problems. The first is (as with every stage of this model) just getting the orientation of the interstage right. The basic part is symmetrical—a simple conic frustum with four retro-rocket fairings evenly placed around it. But it needs to be painted with a pattern that is strongly asymmetrical—four quadrants each with their own black/white scheme. So its orientation needs to be judged from how it fits to the parts above and below. The upper end of the interstage contains two locating studs intended to fit between flanges at the base of the S-IVB stage. But there are a lot of flanges, the kit instruction booklet contains no diagram of the intended fit, and none of the possible orientations make any sense when compared to photographs of the real launch vehicle. All but one of the slots between flanges are associated with locating points for kit parts to be applied to the S-IVB itself. The remaining slot is a little wider than the others, so it seems likely that it was intended to engage with the wider stud on the aft interstage. After a little deliberation, I sanded off both studs, with the intention of placing one of my own later, to engage with this slot on the S-IVB. The base of the kit interstage has flanges of its own, with a broad locating gap intended to engage with a pair of locating strips moulded into the forward skirt of the S-II kit part. So that looks promising. There are two visible landmarks on the kit’s S-II forward skirt—a notch that marks the location of the service tunnel, and a circular depression that marks the location of the liquid hydrogen vent pipes. Unfortunately, these two landmarks aren’t even properly aligned with each other, and neither of them is in a correct relationship with the axes of the interstage as defined by its retro-rocket fairings. After checking with David Weeks’s jawdroppingly lovely Saturn V technical drawings, I sanded off the locating strips of my S-II forward skirt, and added styrene replacements 11/16″ (17 mm) to the right (as viewed from inside the skirt). This brings the S-II service tunnel into an appropriate orientation with the retro-rockets of the interstage, and I can deal with the LH2 vents as a separate issue when I get to that stage. Next I needed to think about the kit’s depiction of the retro-rocket fairings, which isn’t great. New Ware’s detailing set provides a set of resin replacement parts, which are slimmer than the kit detail, and include a moulded depiction of the detachable front covers of the fairings. However, I would need to chisel out the moulded kit detail and refill smoothly around the resin replacements. After a bit of consideration, I decided not to risk the potential carnage I could wreak during such a replacement. Instead, I compromised by adding the front covers to the existing kit moulding, using epoxy resin and a little bit of masking tape. On, then, to the paint masking. Having sworn off using Bare-Metal Foil after my struggle with it while building the Instrument Unit, I suddenly became enamoured of it again. I couldn’t think of any better way to mask the corrugated surface created by the interstage stringers. So for the arc of the model that requires a black/white horizontal demarcation, I measured along the length of each stringer with a precut length of styrene strip, marked with a pencil, and then masked with an individually patch of Bare-Metal Foil, carefully bedded into the space on either side of the stringer using a tooth-pick and a cotton bud. The interstage was also marked with contrasting sway targets—little 2×2 checkerboards that allowed launchpad cameras to track any swaying of the launch vehicle. I masked these off, too, but ran into a couple of problems. The first is that the Revell kit’s stringers are notoriously overscale, and if I tried to stick to the correct size for the sway targets, they were just too distorted by the relatively large stringers and didn’t look square. So I ended up making them a little oversize, copying the dimensions of the sway target decals provided with the kit. The other problem is that David Weeks’s otherwise excellent technical drawings show two very slightly different positions for the sway target in quadrant B of the interstage—I didn’t notice this until after I’d masked and painted, and it looks like I chose the wrong diagram to follow. The Bare-Metal Foil was as hard as ever to remove, and again needed a little white spirit to remove a dark residue from the white paintwork it had masked—but I got away without significant leaks, which was a major triumph. With the interstage properly coloured, I put the S-IVB in place, correctly aligned, and made a light pencil mark where I needed to add a new locating stud to the interstage to register the flanges of the S-IVB stage correctly. And that was that. The Saturn V stack grows ever higher, but I’m going to take a break and do something else before I tackle the travesty that is Revell’s S-II stage.